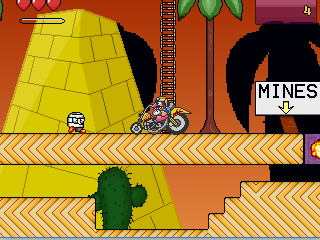 Project Wario Land (working title) features a mixture of custom graphics and ripped graphics. It also contains several custom composed songs! The gameplay has a mixture of Wario Land 3 and Donkey Kong 64/Super Mario 64 styles. You have levels that (mostly) all have 4 star missions in them. As you collect stars, you unlock more levels. However! Many stars are out of reach at first; normal Wario cannot get them. That's where the new Transformation Boxes come into place! As you collect coins, you can spend them in the Shop to unlock various Wario transformation boxes around the levels, including Biker Wario, Dragon Wario, and more! As you unlock these, you are able to transform into them and reach new areas in the levels to find more stars! If you want to, there is also a Hard Mode you can try out. Here, you will take double damage, there will be no heart pickups in the levels, enemies are faster, and there are various small changes throughout the levels. Each level also contains a Heart Stone. It's a hidden red gem that will increase your total number of hearts if you complete the level after collecting it. Try to search and find them all! I've worked really hard on this. I'm using Clickteam Fusion 2 with the Platform Movement Object, and from there, the movements are custom made by me. I really hope you like it, and I really hope the game is descent so far! This looks like a lot of fun and the menu is very nice but I can't enter any of the missions. I've pressed every button and have tried tinkering with the controls but unfortunately I can't get past that screen. I played some levels and I really liked it, it's a nice concept of game. I think that it should have a run button, sometimes the game feels "slow" and repetitive when you are collecting the third or forth star in the same level (I think the problem is not playing over and over again the same level with the same level design, I think the problem is that Wario is not fast and this can screw gameplay). Great game tho! Agreed! Excited to try but cannot figure out. Even tried using an xbox controller as a joystick with no luck. It's nice to see you making Wario fangames again, WwwWario.